The St Peter's Orphan and Convalescent Home for Girls (also known as Archbishop Tait's Home) was founded in 1866 by Catherine Tait, wife of Archibald Tait, the Archbishop of Canterbury from 1868 to 1882. The home was originally established in response to the 1866 cholera epidemic in the East End of London which left many dead and their children orphaned. While money was being raised for a permanent building for the home in Broadstairs, temporary premises were occupied; in May 1870, a small house near Fulham was being used, with thirty-four orphans then in residence. From 1867, the running of the home was carried out by the Sisters of the Community of St Peter, a nursing order with experience in treating cholera victims. The foundation stone for the new building, on Lanthorne Road, Broadstairs, was laid by Catherine Tait on December 21st, 1868, and it was completed in 1870. The design, by Mr John P. Seddon, was 'a stately and substantial structure of flint with freestone dressings and brickwork in the Early Decorated style.' A chapel occupied the space of two upper storeys in one wing. School-rooms, a dining hall and visitors' room occupied the ground floor, and dormitories the remainder of the upper two storey. A basement under the whole building contained laundries, kitchen, play-room etc. The location of the home is shown on the 1896 map below. St Peter's Orphan and Convalescent Home for Girls / Tait Home site, Broadstairs, c.1896. The stated object of the children's home was 'to maintain and educate 80 orphan girls, preference being given to those from London and the Diocese of Canterbury.' Applicants had to be aged between 3 and 10 years of age and have lost both parents or, under special circumstances, one parent. Applications were to be accompanied by a 'responsible recommendation', and a medical certificate, and a certificate of parents' marriage was then required if the candidate was considered suitable. A payment of £15 a year was required for each girl, for which a named person had to be responsible. For applicants whom no-one had offered to provide payment, efforts were made to find 'lady associates' to contribute towards the payment. Up to the age of 13, children were taught in the home's school; from 13 to 16 they also received industrial training as well as instruction. Each child was watched over by an 'associate,' who undertook to get to know her her and to try and take the place, to some degree, of the parent she had lost. A convalescent home was erected at the Lanthorne Road site in 1875. In the 1920s, St Peter's absorbed the Burgos Home, formerly at Croydon. In 1942, the home was taken over by the Waifs and Strays Society home and renamed the Tait Home. Soon afterwards, however, the home was evacuated for the remainder of the Second World War to The Crow's Nest, Mortehoe, near Woolacombe, in Devon. The home's post-war re-opening in Broadstairs was fairly short-lived and it closed in around 1950. 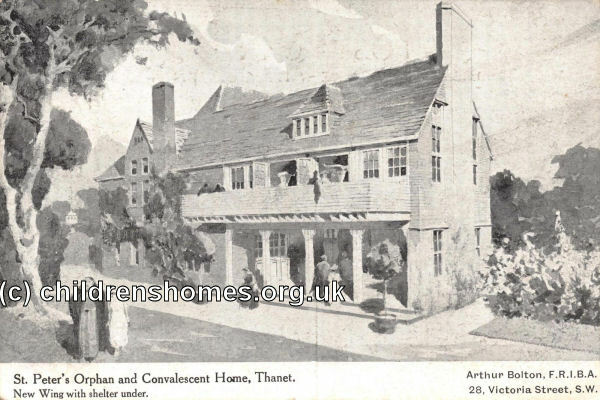 In 1952, the property may have briefly housed a Waifs and Strays home for babies, known as Davidson House, which then relocated to the Florence Anderson House Home in Ramsgate. The St Peter's building was demolished in 1953 and modern housing now occupies the site.